Last year, my first after grad school, I took a year-long position in Oxford, Mississippi. A (mostly) life-long New Englander, my knowledge of north Mississippi was shaped primarily by O Brother, Where Art Thou? and a handful of William Faulkner stories. I figured the place to be bleak and desolate, and I expected the birding to be the same. Quite to the contrary, I absolutely loved birding in north Mississippi, and especially in the delta. The state is split pretty much in half down the middle, the eastern half comprised of hills and forests while the western half leading to the Mississippi River is a flood plain, flat as a pancake. The river is a natural highway for birds migrating southward, and most birders have heard about the Mississippi Flyway. Heard of it, but maybe not so many have seen it. I certainly wasn't prepared for the numbers of birds that I found in the delta and how fun it was to be one of the few birders there. It's too hot to do much of anything in the middle of the summer, but that's ok because the birding doesn't really start to get good until August. That's when the shorebirds start coming, and when it's time to visit the catfish farms. Catfish farms, like these near Tunica as seen from Google Maps, are huge manmade ponds in the delta. There are dikes built up to keep the water in, meaning that you can't see what's in the ponds until you drive up onto the dikes. I loved that moment of anticipation of climbing the up the dike road, hoping for a giant wader-covered mudflat to be uncovered. Many of the catfish farms in the delta are no longer operational or are, for whatever reason, pumped clear of most of their water by August. The resultant mudflats are rich with shorebirds: stilts, avocets, sandpipers, plovers, willet, yellowlegs, and occasional godwit. In the winter, ducks and geese can be found in the ponds that hold water all year around. 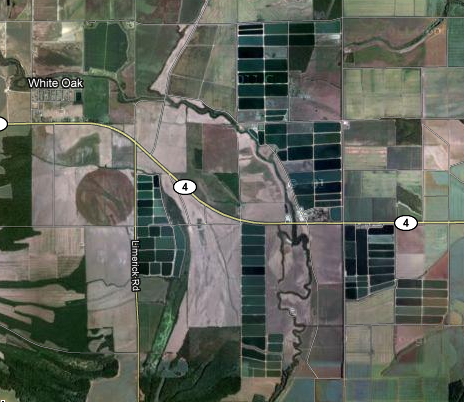 Access to catfish farms is sorta weird. Some have "no trespassing" signs, so don't trespass. Others don't have anything: no nearby houses, no one working there, no nothing. Twice I was approached by people while birding catfish farms: one just asked if I was fishing and when I told him I wasn't he left me along, the other gave me a bunch of crap about being on private property without permission (there was no indication anywhere of how to contact the owner) and told me to leave. Birding catfish farms is fun, primarily because there are so few birders and so many birds - the potential for discovery is high - but do so courteously and cautiously. 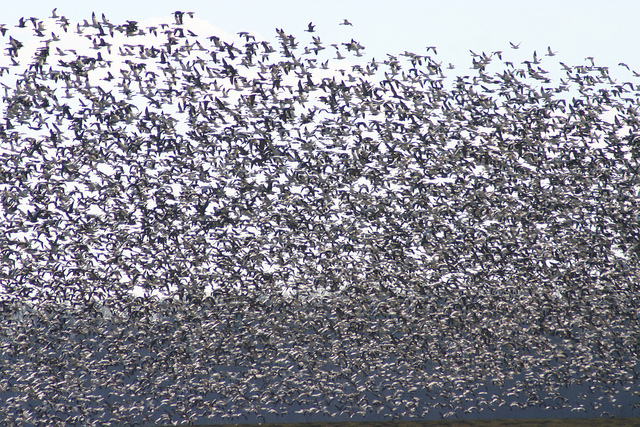 In winter, the desolate-seeming delta comes alive with wintering birds. 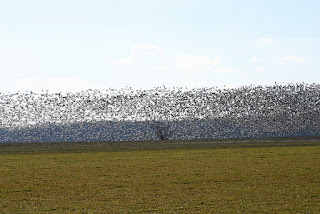 Almost the instant you make the abrupt shift from eastern hills to the floodplain, you start to see large flocks of blackbirds (rustys, red-winged, cowbirds, grackles, etc) and geese (snow, ross' and greater white-fronted, primarily) in the air. The area is also a wonderful place to see wintering hawks, especially red-tails. It's common to see Krider's, Harlan's and eastern subspecies of red-tailed in a single day. 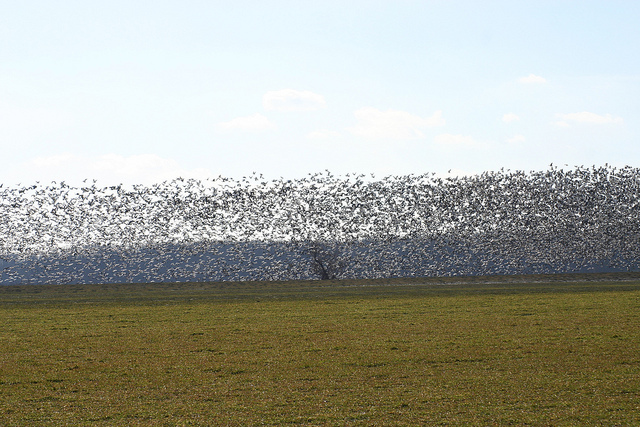 The flock above is part of a massive snow/ross' flock near Tunica, MS. 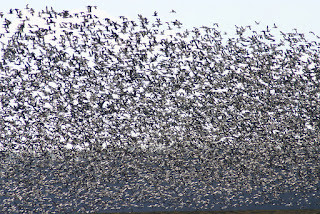 Such flocks are common in winter at the north Mississippi delta. Also a surprising number of gulls can be found in the delta. A careful search of gulls wintering near Tunica (especially if you've got Gene Knight or Jeff Wilson helping you out) can turn up Thayer's, California, Franklin's or Iceland gulls. I found one of the state's few records of black-headed gull on nearby Sardis Lake this past year. If you happen to bird after a hurricane has swept up from the Gulf (harmlessly to humans, I hope), everything from frigatebirds to storm-petrels to skua are possible. I wasn't sure what birding north Mississippi would be like, but I got out nearly every weekend and enjoyed every minute. I hope it someday gets the recognition it deserves for being such a hotspot. There are also bald eagles in North MS as well. You just have to know where to look but there are many of them.